MG Window Systems is an established family run business led by owner Mark Russell. Mark will guide you through your whole installation from first visit at quotation stage, during installation and on completion. Even after fitting we offer advice and carry out repairs covered by your 10 year guarantee. We have been looking after homeowners for more than 26 years in Northampton and surrounding areas, providing good solid advice and supplying a quality market leading VEKA product. On top of this honest reliable service you are also covered by a genuine 10 year Independent Network Insurance backed guarantee on Parts AND Labour. So not only do we use the market leading VEKA profile with all installations covered by the Independent Network guarantee but all work is compliant registered with Fensa. We do not employ hard sell tactics nor do we start high with our estimates offering you discounts to win your custom as we are a Buy with Confidence approved company. 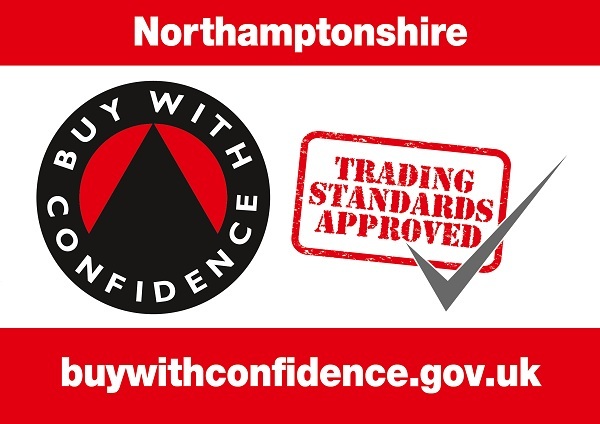 This is run by the Government body Northampton Trading Standards and part of this membership means no Cold Calling or hard sales tactics, something MG Window Systems wholly subscribe to. If you use MG Window Systems there is no deposit to pay and in fact you do not pay until your products have been installed. We use a policy of trust and feel this is the right position to start from. For a refreshing, hassle free experience call and speak to Mark or James on 01604 877977. You will not be disappointed please take some time to look through our site and read our reviews. No high pressure sales techniques. An owner of the company will visit and chat about your requirements, take brief measurements and you will then receive a quote in the post. Aluminium windows are strong, durable and easy to maintain making them the perfect choice for your home. Please note that all telephone calls are recorded and kept for training and admin purposes.